After a live reunion which saw them play to large audiences across Europe throughout 2017 Britain's elder statesmen of electronic music Orbital announce they're back for good – with new music and an upgrade of the live show that transformed festivals across the world. 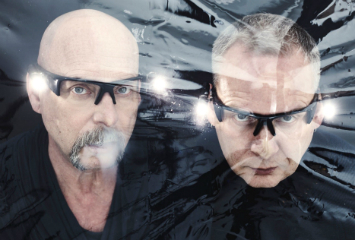 Reunited brothers Paul and Phil Hartnoll release their third track from the forthcoming album, The End Is Nigh on 31st August 2018. Their first new album in six years - the one even fans wondered if they'd ever hear - called Monsters Exist – will be released on 14th September. The album is a more classically structured Orbital album than their previous release Wonky, drawing inspiration from the international political landscape all the way back from Paul and Phil's pre-rave squat-punk roots, right up to the volatile tensions and erratic rhetoric of today. "When you haven't made an album in six years it just comes tumbling out," says Paul. "Because of the global situation I was torn between writing a really aggressive Crass-type album that says 'F*ck The Man!' or going back to rave sensibilities. You know, let's really rebel by stepping away and actually living that alternative lifestyle." But the idea of 'Monsters Exist' tied it all together. "You don't need to spell out who the monsters are," he says. "We're not pointing our fingers at Donald Trump or Kim Jong-un. It's clear who the monsters are. I've never liked preaching to people. It"s much better to provoke a bit of thought." Phil puts it more succinctly: "It's a reflection on modern day monsters." "That can mean anything from bankers and The Man or your own demons and fears. The monsters inside you,"
Among the tracks in progress is a cosmic piece featuring an address for the possible end of the world by Prof. Brian Cox ("It's Brian being emo," says Paul. "Brian Emo"). There's also an epic state-of-the-planet title track featuring, "Anguish, dread and News at Ten-style drama." "The masterplan for this one," says Paul, "Is to make a bloody good album. And then see what happens." Reconnecting with Orbital's past, acclaimed avant-garde artist John Greenwood, who painted the famous bulbous and organic artwork for 1994's Snivilisation and 1996's In Sides albums, will return to create the cover of Monsters Exist. Some twenty years after he first collaborated with Orbital, Greenwood's shifting shapes and comical hybrid organisms – the Chapman Brothers meets Monsanto, or maybe Hieronymus Bosch-bosh-bosh – feel even more in sync with an era obsessed with its own genetic monsters. "We've always loved John's work," says Phil, "And it feels especially right for this record." The brothers have a pact. Whatever happens, Orbital does not stop. "We've learned to talk to each other rather than let things stew, and it"s much better," says Phil. "We used to waste a lot of energy wondering what the other one was thinking and getting on each other's nerves. But now we actually talk! And it's brilliant." "It was silly really," adds Paul. "We're brothers and business partners and creative partners, so we were three times as likely to fall out. "But, in the end, we had to remind ourselves that Orbital is something we"re really proud of and that we love doing it."